Whether they serve as inspiration for new digital societies or as the raw material for remediated texts, the imagery, events, narratives, and sociopolitical structures of the Middle Ages sit at the heart of gaming culture. Retellings of canonical texts like Beowulf and Inferno have made their way into mainstream gaming, while fantastical digital universes such as World of Warcraft and Dragon Age draw from later medievalisms like Dungeons and Dragons and the works of Tolkien for their inspiration. The ludic and technical structures of video games also provide different challenges and affordances for neomedieval expression. One might explore digitally restored landmarks, reenact or alter historical events, or interact with simulated material objects like scrolls and books in new ways. 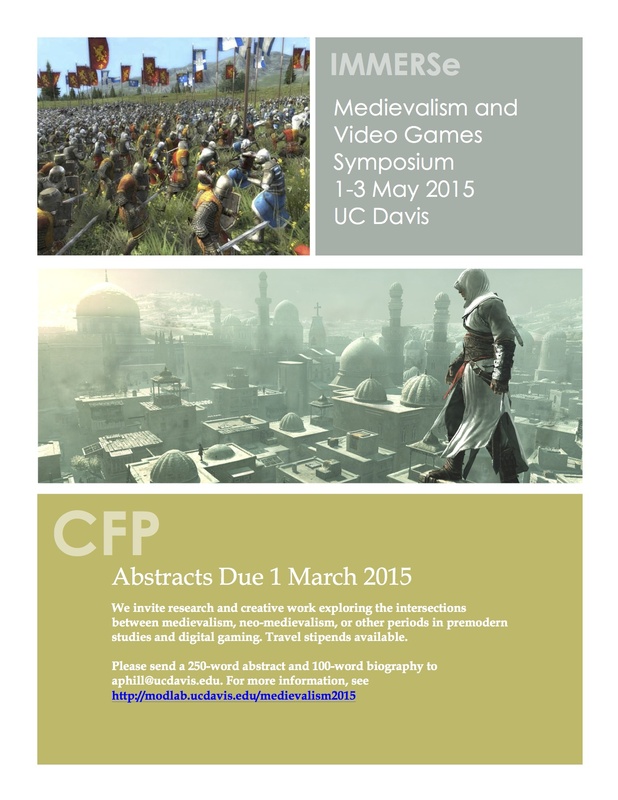 We invite research and creative work exploring the intersections between medievalism, neo-medievalism, or other periods in premodern studies and digital gaming. Your primary disciplinary orientation—for example, medieval studies or game studies—is less important than a commitment to engage in cross-disciplinary conversations with other scholars. Innovative interdisciplinary perspectives and new approaches to scholarly production are particularly welcome. The IMMERSe Medievalism and Video Games Symposium will be held in conjunction with the University of California Davis Humanities Institute Digital Premodern Conference, which will explore medieval studies and the digital humanities more broadly. Please send a 250-word abstract and a 100-word biography by Sunday, March 1, to Amanda Phillips, IMMERSe Postdoctoral Fellow: aphill@ucdavis.edu. Indicate what type of presentation you envision and whether you have any flexibility in this format. Stipends for travel and assistance with accommodations are available. Preference for this funding will be given to junior scholars, contingent faculty, IMMERSe research network affiliates, and others demonstrating financial need due to distance traveled or other circumstances. If you would like to be considered for a travel stipend, please include with your submission a brief (no more than 250 word) request addressing your need and eligibility. IMMERSe (The Interactive and Multi-Modal Research Syndicate) is an international collaboration of game studies researchers funded by the Social Science and Humanities Research Council of Canada. The University of California, Davis, is located in Davis, CA, minutes from Sacramento and a short train ride or drive to the San Francisco Bay Area.